A Dino-Mite Duo | Bookworms | Kids VT - small people, big ideas! Dinosaurs no longer roam the earth, but they live on in countless children's books. 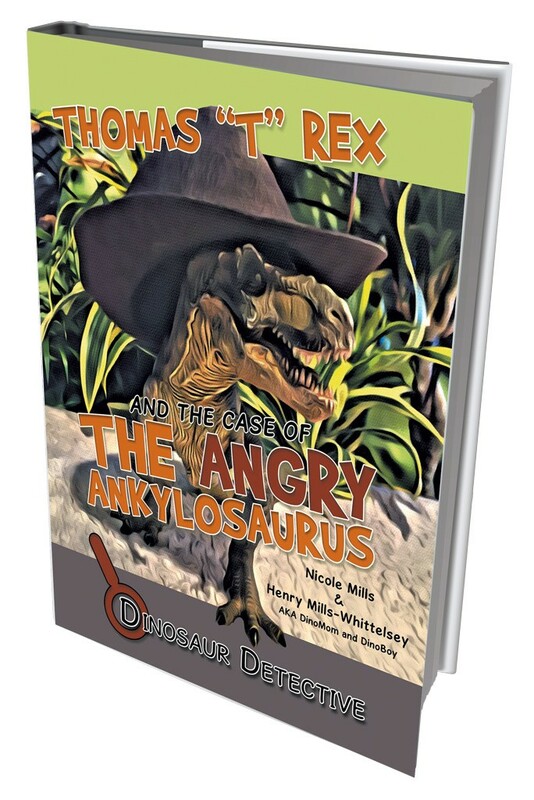 The recently released Dinosaur Detective: Thomas "T" Rex and the Case of the Angry Ankylosaurus stands out because of its unusual authors — a mother-son pair from Dorset, Vt. Former Cosmopolitan magazine associate publisher Nicole Mills and her 7-year-old son Henry Mills-Whittelsey collaborated on the picture book, which breezes along with snappy rhymes and scintillating prehistoric facts. To create the illustrations, Henry posed his plastic dinosaurs, which Mills photographed; she then digitally altered the images to look like paintings. Intended as the first installment of an A to Z series, the story features an upset Ankylosaurus named Alistair, who hires a detective to search for his vanished ferns. Curious about the origins of this unique book, Kids VT called Mills for the inside scoop. Kids VT: What inspired you to create a book with your son? Nicole Mills: When Henry was 3, like a lot of young children, he became obsessed with all things dinosaur. I was astounded by his ability to accumulate an almost encyclopedic knowledge about these creatures. It was fascinating for me. I'm a little bit of a nerd myself, and I was learning right along with him. I loved that connection. KVT: And so that became a book? NM: Well, it was a little more complicated than that, of course. He had a lot of dinosaurs whom he called "his guys," and he liked to create elaborate setups and stories. One day, he noticed his story was a mystery and he needed a dinosaur detective. And so the book began percolating. I started photographing his guys, and I began to think, there's something to this. All the pictures in the book use Henry's dinosaurs, and he had input on everything. KVT: How did this book make its way out into the world? NM: I was an associate publisher at Cosmopolitan and had a big and glamorous job, and then I hit the wall with all of that. I knew I was missing out on too much of my son's childhood. Now we live in Dorset, where my son has 13 other kids in his class, and he's really thriving. To bring this book to light, I chose Archway Publishing, a self-publishing division of Simon & Schuster, which offers a lot of help in the heavy-lifting parts of publishing. KVT: What advice would you offer parents who want to pursue a creative endeavor with their kids? NM: Follow along with your kid's passions and obsessions. See where you might go. Henry taught himself so much, and I've gone along his path with him way farther than I ever would have expected. I haven't regretted a moment of it.